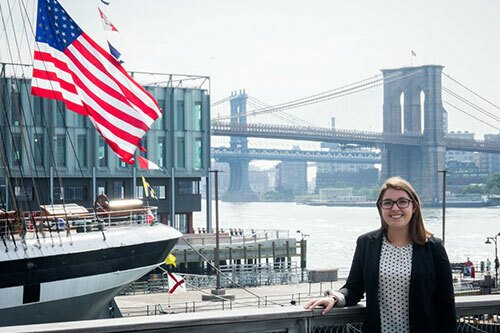 Madeline Finnegan ’18, will be continuing her involvement with the Federal Reserve Bank of New York full-time after she graduates in May. In summer of 2017, Finnegan worked as a Summer Research Analyst where she contributed as part of the Financial Intermediation team. She interned with economist Anna Kovner on a research project about housing mobility surrounding the 2008 financial crisis. On a typical day, she would meet with Kovner to give updates on her work and then would be given topics to investigate. She would then spend most of the day finding answers to project questions using statistical programming software. Finnegan was also connected with other interns, full-time Research Analysts, and other visiting scholars as part of her internship. How did Finnegan find her job? “Through a LinkedIn advertisement, funny enough! As an economics major, I have been interested in the Federal Reserve and its career opportunities throughout college, but I didn’t take the plunge until I saw the ad.” With the support of an NC State professor who had worked at a branch of the Federal Reserve, she applied in anticipation of an internship that could lead her to a full-time offer. Just as she had hoped, she has been offered a two-year, full-time Research Analyst position on the same team that she worked with this summer. “I couldn’t ask for a better first step after college than this.” Specifically, she is looking forward to the opportunity to determine whether research in economics is something that she wants to pursue long-term. She is excited to work with a number of economists every day, be supported as she considers applying for Economics PhD programs, and be surrounded by like-minded individuals in economics.